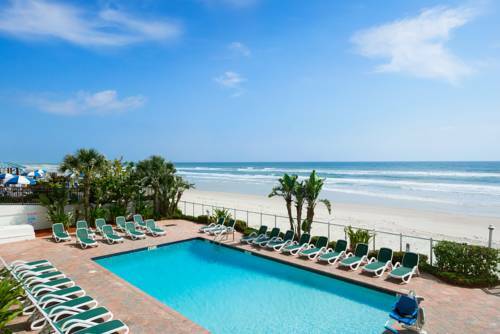 Welcome to the Days Inn Daytona Oceanfront hotel located on the beach in Daytona. Fishing, boating, miniature golf, restaurants, seafood and other fine dining are a short walk away. Spacious guest rooms feature large private balconies, refrigerators, cable television many have fully equipped kitchens with microwaves. Relax on our huge sun deck with heated pool,Jacuzzi, and shuffleboard. Our modern 7 story hotel has interior corridors, covered parking, and coin laundry. We are 5 miles East of I-95 exit 256. A great place for a family to spend a night or an extended vacation. ~56 miles from Daytona Beach. ~53 miles from Daytona Beach. ~58 miles from Daytona Beach.